For other uses, see Heidegger (disambiguation). Heidegger married Elfride Petri on 21 March 1917, in a Catholic ceremony officiated by his friend Engelbert Krebs [de], and a week later in a Protestant ceremony in the presence of her parents. 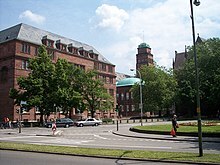 Their first son, Jörg, was born in 1919. Elfride then gave birth to Hermann [de] in 1920. Heidegger knew that he was not Hermann's biological father but raised him as his son. Hermann's biological father, who became godfather to his son, was family friend and doctor Friedel Caesar. Hermann was told of this at the age of 14. Hermann became a historian and would later serve as the executor of Heidegger's will. 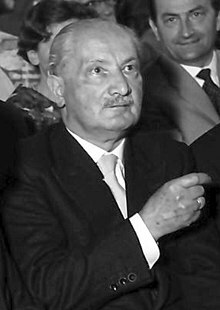 In Being and Time, Heidegger criticized the abstract and metaphysical character of traditional ways of grasping human existence as rational animal, person, man, soul, spirit, or subject. Dasein, then, is not intended as a way of conducting a philosophical anthropology, but is rather understood by Heidegger to be the condition of possibility for anything like a philosophical anthropology. Dasein, according to Heidegger, is care. In the course of his existential analytic, Heidegger argues that Dasein, who finds itself thrown into the world (Geworfenheit) amidst things and with others, is thrown into its possibilities,[incomprehensible] including the possibility and inevitability of one's own mortality. The need for Dasein to assume these possibilities, that is, the need to be responsible for one's own existence, is the basis of Heidegger's notions of authenticity and resoluteness—that is, of those specific possibilities for Dasein which depend on escaping the "vulgar" temporality of calculation and of public life. Heidegger's later works, beginning by 1930 and largely established by the early 1940s, seem to many commentators (e.g. William J. Richardson) to at least reflect a shift of focus, if not indeed a major change in his philosophical outlook, which is known as "the turn" (die Kehre). One way this has been understood is as a shift from "doing" to "dwelling" (Wohnen) and from Being and Time to Time and Being[incomprehensible] (This aspect had a particular influence on architectural theorists in their focus on place and space in thinking about dwelling. Such is the case with the work of Christian Norberg-Schulz and the philosopher-architect Nader El-Bizri.) However, others feel that this is to overstate the difference. For example, in 2011 Mark Wrathall argued that Heidegger pursued and refined the central notion of unconcealment throughout his life as a philosopher. Its importance and continuity in his thinking, Wrathall states, shows that he did not have a "turn". A reviewer of Wrathall's book stated: "An ontology of unconcealment [...] means a description and analysis of the broad contexts in which entities show up as meaningful to us, as well as the conditions under which such contexts, or worlds, emerge and fade." Heidegger focuses less on the way in which the structures of being are revealed in everyday behavior, and more on the way in which behavior itself depends on a prior "openness to being." The essence of being human is the maintenance of this openness. [incomprehensible] Heidegger contrasts this openness to the "will to power" of the modern human subject, which is one way of forgetting this originary openness. Two recurring themes of Heidegger's later writings are poetry and technology. Heidegger sees poetry and technology as two contrasting ways of "revealing." Poetry reveals being in the way in which, if it is genuine poetry, it commences something new. Technology, on the other hand, when it gets going, inaugurates the world of the dichotomous subject and object, which modern philosophy commencing with Descartes also reveals. But with modern technology a new stage of revealing is reached, in which the subject-object distinction is overcome even in the "material" world of technology. The essence of modern technology is the conversion of the whole universe of beings into an undifferentiated "standing reserve" (Bestand) of energy available for any use to which humans choose to put it. [incomprehensible] Heidegger described the essence of modern technology as Gestell, or "enframing." Heidegger does not unequivocally condemn technology: while he acknowledges that modern technology contains grave dangers, Heidegger nevertheless also argues that it may constitute a chance for human beings to enter a new epoch in their relation to being. Despite this, some commentators have insisted that an agrarian nostalgia permeates his later work. ^ Zupko, Jack (28 December 2017). Zalta, Edward N. (ed.). The Stanford Encyclopedia of Philosophy. Metaphysics Research Lab, Stanford University – via Stanford Encyclopedia of Philosophy.